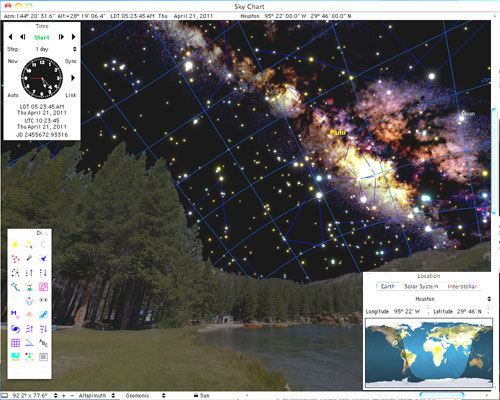 View the heavens on your computer from any place on the Earth, in the Solar System, or beyond. Witness celestial events thousands of years in the past or future. Voyager includes millions of stars, clusters, nebulae, and galaxies visible only through powerful telescopes. 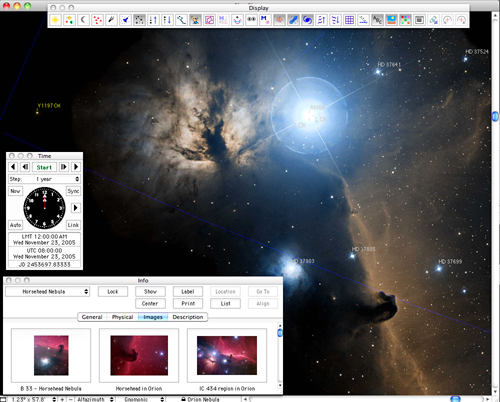 This professional version of our software is designed for the advanced user with a serious interest in astronomy. Voyager can be used to control computer-driven telescopes to show you what is actually being simulated on your computer screen. Voyager 4.5 includes a powerful set of features and capabilities. Voyager 4.5's windows and dialog boxes contain native controls that better match the Aqua interface of Mac OS X and the Windows Aero theme. Voyager 4.5 includes many new 360-degree horizon panoramas, including Cathedral Rock in Arizona, a mirror-still lake in upstate New York, and a tropical beach in Hawaii. 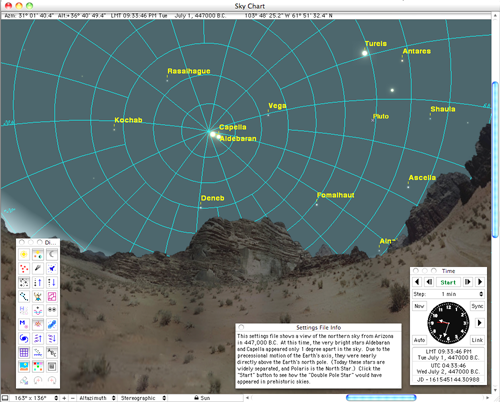 You can create your own digital horizon panorama, and show the sky as it appears from your backyard! 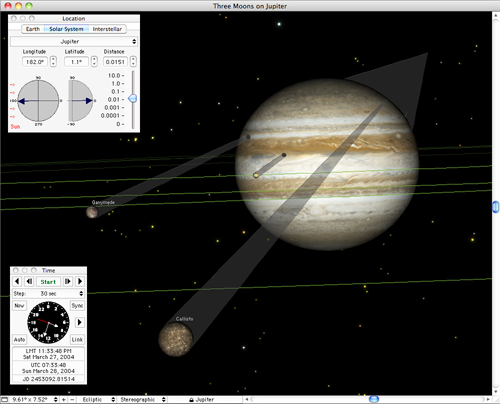 Voyager 4.5's planet, moon, ring, and shadow drawing code has been completely rewritten to include the effects of perspective and rotational flattening. See Saturn's moons cast their shadows across the planet's ellipsoidal face; get a proper "astronaut's-eye view" of the Earth from the International Space Station. Voyager 4.5 has updated high-resolution maps of the Earth, Moon, and Mars; and adds new high resolution maps of Saturn's moons from the Cassini mission. Planets and moons are rendered realistically, using the latest imagery from NASA's Clementine, Magellan, Mars Global Surveyor, Galileo, and Cassini missions. Viewed from the front the side of Titan, the surface of Saturn's largest moon shows details first unveiled by the Cassini spacecraft's infrared camera. Voyager 4.5 has updated animations of solar and lunar eclipses; spacecraft encounters with the major planets; rare shadow transits on Jupiter and Saturn; the changing shape of the constellations over tens of thousands of years; a journey around the Pleiades and Hydes star clusters; precession of the celestial pole over its 26,000 year cycle; and the orbits of the newly discovered dwarf planets in the outer solar system. A rare triple transit of Jupiter's moons Io, Ganymede, and Callisto on March 28th, 2004, showing the moons and their shadow cones magnified by 4x. Voyager 4.5 can now download and import the latest orbit data for comets and asteroids directly from the Minor Planet Center. It can also download and import satellite orbit files in standard NORAD TLE (Two Line Element) format - all to ensure accurate position predictions. 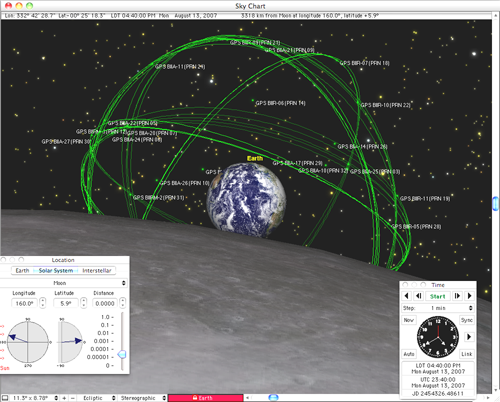 Bring your Solar System up to date with a single click of the mouse! as seen from beyond the Moon. 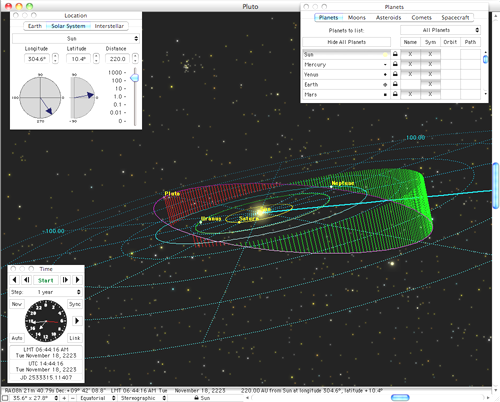 Voyager 4.5 contains a high-performance implementation of JPL's state-of-the-art DE408 planetary ephemeris. It computes the positions of the planets more accurately, and dozens of times faster, than any previous version. You can optionally include corrections for light time, aberration, dynamic time, and other effects to reproduce the ephemerides in the Astronomical Almanac to sub-arcsecond precision. The inclination of Pluto's orbit is displayed using drop lines - the red and green regions are respectively where Pluto is above and below the ecliptic plane. Voyager 4.5 now lets you select and display the many new kinds of outer solar system asteroids, Kuiper Belt objects, and "dwarf planets" that have been discovered in the 21st century - including Neptune Trojans, Plutinos, Twotinos, and "Cubewanos". 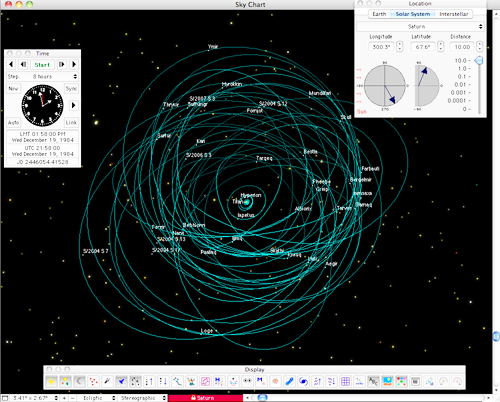 The Main Belt asteroids (red) and East/West Trojans (yellow/blue), in relation to the orbits of the planets. Voyager 4.5 accurately models the precession of the Earth's axis, the motions of the stars and planets back to the dawn of humanity. Voyager 4.5 extrapolates lunar and planetary positions forward and backward realistically over 500,000 years from the present - and for times within 10,000 years of the present, Voyager 4.5's lunar and planetary positions will match JPL's precisely. Voyager 4.5 includes support for the Hebrew, Islamic, Persian, Indian, and Mayan calendars. Find the dates and times of new moons that mark the start of Islamic months, or determine the date that the Mayan calendar predicts the "end of the world". Seen from Arizona in 447,000 B.C., Aldebaran and Capella were double pole stars due to precession and stellar proper motion. Voyager 4.5's basic stellar database is derived from the latest version (v5) of NASA's SKY2000 Master Star Catalog, and the older Hipparcos, Tycho-1, and Tycho-2 catalogs. It is a complete and comprehensive compendium of data on more than 2.5 million stars brighter than magnitude 12. Voyager 4.5 includes the latest version of the Washington Double Star catalog, with information on more than 104,000 multiple systems and over 2,000 binary stars. 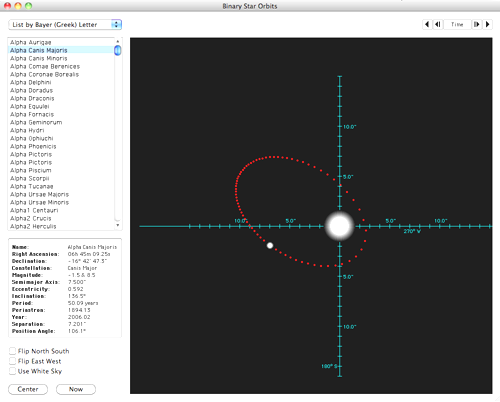 View the components of binary stars such as Alpha Centauri, or the "Double Double" in Lyra - orbiting each other over hundreds of years! from the latest Washington Double Star catalog. 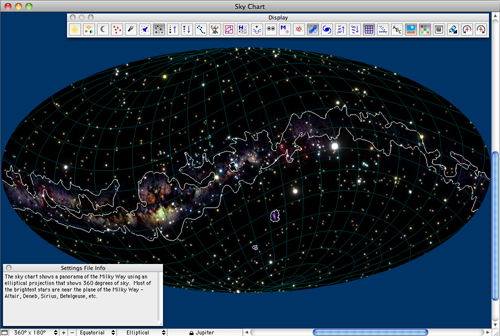 Voyager 4.5 can unwrap a 360-degree panorama of the sky onto your computer screen, using the same Mercator, Elliptical, Gnomonic, and Sinusoidal projections that are used to show maps of the Earth. of the Milky Way along the galactic plane. 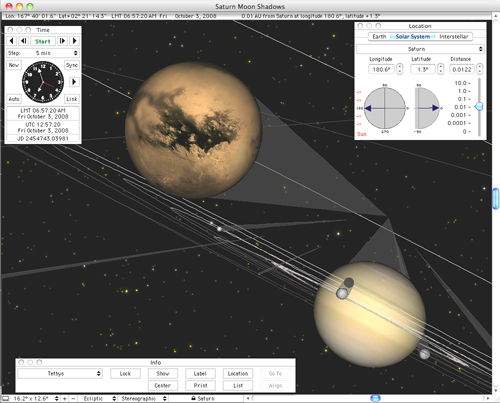 Voyager 4.5 embeds high-resolution color images directly into its sky charts. 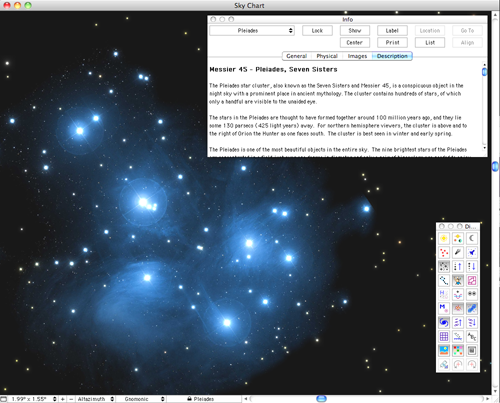 This includes hundreds of Messier, Caldwell, and other deep sky objects from the second-generation Digitized Sky Survey. New databases of star clusters, nebulae, and galaxies, use 21st-century sources wherever possible. This includes the Wilton Dias open cluster catalog (April 2008) and the Principal Galaxy Catalog (September 2008), containing data on more than 1.6 million galaxies. These are cross-referenced with Wolfgang Steinicke's latest Revised NGC and IC Catalogs (April 2008). are embedded in the sky charted against the background stars. Voyager 4.5 includes data for nearly a hundred new planetary moons that have been discovered in the 21st century. In addition, you can now customize the display options for every planet and moon in the Solar System individually. View Titan's surface as seen by Cassini's infrared camera; watch Saturn's "shepherd" moons orbiting outside the delicate F-ring; view the chaotic mix of Jupiter's "temporary" outer moons orbiting in retrograde around the planet. miles from the ringed planet. Voyager 4.5 now includes extensive descriptions for hundreds of planets, moons, stars, clusters, nebulae, and galaxies, developed in conjunction with professor Jim Kaler of the University of Illinois. Learn the history and mythology of the constellations. Discover "fun facts" about the objects you can see in the night sky! descriptions containing interesting facts and background history. 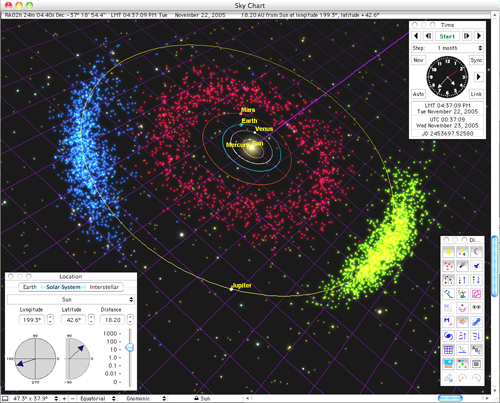 Voyager 4.5's basic stellar database is derived from the latest version (v5) or NASA's SKY2000 Master Star Catalog, and the older Hipparcos, Tycho-1, and Tycho-2 catalogs. It is a complete and comprehensive compendium of data on more than 2.5 million stars brighter than magnitude 12. Voyager 4.5's DVD version expands its basic stellar database by including all stars from the second-generation Guide Star Catalog brighter than magnitude 18 - a total of more than 155 million stars. Unlike its predecessor, the GSC2.3 contains color and proper motion information in addition to just position and magnitude, and represents a much more complete and statistically-even sampling of the sky in both hemispheres. 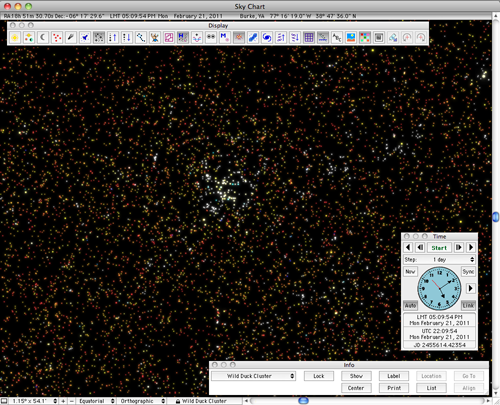 The star field near M11, the Wild Duck Cluster, shows stars to 18th magnitude using data form the second generation Guide Star Catalog. Voyager 4.5 now supports several new telescope types - including the iOptron SmartStar, Takahashi Temma, Orion Sirius/Atlas/Intelliscope, and ServoCAT Argo Navis. We also support the latest computer-controlled telescopes from Meade and Celestron - including the entire Meade LX-200, LX-200 GPS, and Autostar lines, and the Celestron NexStar, and NexStar GPS series. Many older models, including simple encoder systems, are also supported. Please note that most telescopes will require a USB-to-Serial adapter for telescope communication. 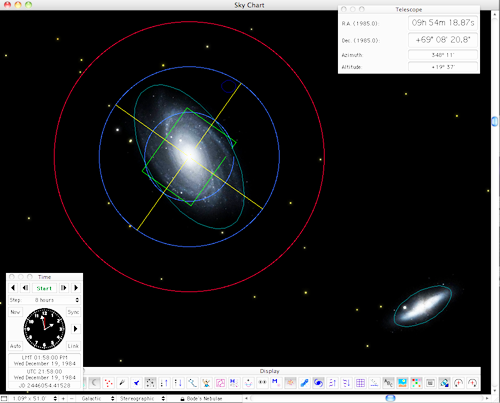 Guide Star Catalog 2 (GSC2), and the Telescope control panel.